To Cite: Soleimanpour H, Mahmoodpoor A, Eftekhari Milani F, Shahsavari Nia K, Mehdizadeh Esfanjani R, et al. Effectiveness of Oral Ketamine, Midazolam, and Atropine Cocktail Versus Oral Diphenhydramine for Pediatric Sedation in the Emergency Department, Iran Red Crescent Med J. 2014 ; 16(9):e21366. doi: 10.5812/ircmj.21366. Background: Sedation is a condition of reduced level of consciousness (LOC) for a patient that is created to decrease irritability, anxiety, and restlessness. Objectives: In this study, we compared the sedative effect of oral administration of ketamine, midazolam, and atropine cocktail with diphenhydramine in the referent children to the emergency department. Patients and Methods: Based on the double-blind randomized clinical trial in this investigation, 80 children, who needed to repair their wounds with suture were randomly divided into two groups: group 1 and group 2, who have received oral diphenhydramine and oral ketamine, midazolam, and atropine cocktail, respectively. Behavioral changes were collected and recorded before, during intervention and two weeks after intervention. Statistical data were analyzed by SPSS-16 software and chi-square and Mann-Whitney U tests were employed to study the relations among variables. P < 0.05 was considered statistically significant. Results: There was no significant difference between two groups in terms of drug acceptance and anxiety degree in children before intervention. Group 2 had achieved better and deeper sedation than group 1 during 45-minute post-medication (P < 0.05, P = 0.01). Regarding pediatric general behavior such as crying or interruptive moves, there was also a significant statistical difference between group 2 and group 1 (P = 0.009) based on Houpt Classification. The mean recovery times in groups 1 and 2 were 34.37 ± 14.23 min and 27.25 ± 5.14 min, respectively (P = 0.003). In terms of behavioral changes, the rate of cumulative frequency was computed for behavioral changes two weeks after the discharge from emergency department in which there were less behavioral changes in group 2 than in group 1 (P = 0.04). Conclusions: Oral administration of ketamine, midazolam, and atropine cocktail induces better sedation than diphenhydramine with respect to its limited mood changes in children, who need a medical procedure at emergency department. The children feel pain at any age even during the neonatal period. Visiting and experiencing contact with medical staff at the emergency department may create anxiety both for the children and their parents. This anxiety may be more problematic than the very pain itself. Moreover, anxiety is contagious among child and parents. This contagious anxiety may exacerbate the anxiety by cycle of escalation (1). Sedation may provide a condition for the child to avoid from an annoying experience that can interrupt physical examination or procedure. Drugs are taken through different routes, including oral, intravenous, muscular, subcutaneous, and inhalation. But the most prevalent and easiest method of taking drugs is by mouth. In fact, this is considered as an art for an emergency physician to maximize the ease and cooperation of a child and to minimize the risks of sedation (2). Sedation may be created by non-medicinal or medicinal techniques and employed for managing non-cooperative or over-anxious patients (2). The non-medicinal technique may be carried out by several methods, including providing a calm and quiet environment, hypnotism, distraction, and cognitive-behavioral methods, etc. The medicinal technique can be employed by the aid of various drugs such as tranquilizers, anticonvulsant drugs, and analgesics (3-7). Various drugs have been taken to create sedation in patients, particularly the children, alone and or in a cocktail to find an appropriate sedative plan in emergency department; however, sedative drugs with higher impact and fewer side-effects are still being sought (2). In the present study, we investigated the effects of oral administration of atropine, midazolam, and ketamine cocktail and to evaluate the rate of their effectiveness in sedation compared to oral administration of diphenhydramine in two groups of children referring to emergency department. This study was approved by the Ethics Committee of Tabriz University of Medical Sciences. Informed written consents were obtained from all parents. We enrolled in our study 80 children ages 2-10 years old, who needed to close their wounds with suture, and they had referred to emergency department at Imam Reza Hospital, a teaching hospital located in Tabriz, Iran within a period of 6 months from January 2013 to June 2013 (8). The exclusion criteria were the patients with psychological diseases, mental disorders, attention deficit hyperactivity disorder (ADHD), multiple traumas, decreased level of consciousness (GCS < 15), common cold, children whose parents refused from participating in the study and/or with both illiterate parents, patients with identified allergy, receiving erythromycin, also patients with chronic background diseases like convulsive disorders, or terminal wounds in organs and limbs, and also in mucus membranes and or wounds larger than 4 cm in diameter, the patients with wound deeper than 0.5 cm as well as patients with more than one ulcer. where σ2 = ((n1 - 1)S12 + (n2 - 1)S22)/(n1 - 1) + (n2 - 1) and considering the power of study as 80% and with 95% confidence intervals, 35 people were calculated for each group, which was later increased to 40 patients to compensate for the expected dropouts or missing data. This investigation is a prospective, randomized, and double-blinded study. The patients were randomized (via website http://www.Randomizer.org) and divided in two groups as followings: group 1 (oral diphenhydramine) and group 2 (oral midazolam, atropine, ketamine cocktail). Diphenhydramine (Pursina-Iran) 1.25 mg/kg was taken by group 1 and oral ketamine (Rotexmedica-Germany) 6 mg/kg, atropine (Alborz Darou-Iran) 0.02 mg/kg, plus midazolam (TehranChemie-Iran) 0.05 mg/kg cocktail was received by group 2. Up to 20 mL of fruit juice (Sunich-Iran) was added to the drug for both groups in order to taste it favorable for children, and it was taken by glass or syringe. The condition of anxiety and tolerance in children was determined before procedure as being cooperative, crying when touching the wound, crying upon physical examination, and uncontrollable crying. Drug acceptance in child and his or her anxiety was recorded through asking questions from the parents as follows: no problem, some persuasion needed, and difficult. The parent was asked to lay his or her child on the exam bed after taking medicine and oxygen cannula was connected to child and during the procedure of his or her level of consciousness and basic vital signs (heart rate, respiratory rate, blood pressure, and Spo2) were monitored. For pulse oximetry heart rate, respiratory rate and blood pressure Alborz B7 (Saadat, Iran) were used. All instruments were calibrated prior to use. In the case of need to local anesthesia, those patients were included in this study that had been anxious higher than level 1 (9). The wound in all of the studied patients was anesthetized by a topical anesthetizing agent (lidocaine spray 4%) and maximum local injection of lidocaine up to 3 mg/kg (Injection of local anesthetizing drug was recorded based on sedation degree every five minutes and if the given degree was less than 4 [or at least 45 min after taking sedative drug], the child would be injected) (10). The child’s behavior pattern was classified as degrees (1-4) based on Houpt classification during procedure. Accordingly, degree 1 consists of the excessive and violent movement that led to interrupting the treatment; degree 2 includes continuous movement that made treatment difficult; degree 3 consists of controllable movement which did not interfere with the treatment; and degree 4 was classified as no movement. Moreover, pediatric overall behavior was also evaluated according to Houpt gradation scale during the treatment. Based on this method, the rate of crying, consciousness, and movement of child as well as pediatric overall behavior during the activity and injection was graded as followings: no treatment was done (aborted), treatment stopped, or it was partially completed (poor), treatment was done by perfect interruption (fair), treatment was entirely done with a little problem (good), there was only a little crying or movement (very good), without crying or movement (excellent) (11). The given oral drug was prepared with the aforesaid doses, and all clinical measures were done by emergency medical staff in the outpatient operation room and also all operations of giving sedative drugs and completion of questionnaires were carried out by a third specialist trained party (out of research project), who was blind to the title of sedative drug as well as grouping of patients. Furthermore, patients’ parents were not informed about the name of the prescribed drug as well. Two weeks after discharging the patients from the emergency department, the possible behavioral changes during these two weeks were asked through telephone calls with parents, including restlessness, insomnia, nightmare, enuresis, immoral disorder, anorexia, impatience, and separation anxiety (10, 11). To conduct statistical analysis of the data, SPSS software (version 16.0; SPSS, Chicago, Illinois) and descriptive statistical analysis was used (frequency, percentage, mean ± standard deviation). Normal data distribution was evaluated by Kolmogorov-Smirnov test. Quantitative data were analyzed by Student’s t test, and if required, Mann-Whitney U test. Also repeated measures analysis and qualitative data were analyzed by chi-square test (X2). P < 0.05 was considered statistically significant. The full trial design is shown in Figure 1. The mean age of the children was 5.02 ± 2.21 y in group 1 and 4.57 ± 2.54 y in group 2 (P = 0.41). Also, the differences between two groups were not statistically significant in terms of gender. The percentages of males was about 67.5% and females 32.5% in both groups (P = 0.23). There was no significant statistical variance between two groups in terms of drug acceptance or compliance (P = 0.13) (Figure 2). Similarly, no significant difference was observed between two groups in terms of pediatric anxiety and tolerance before implementation of procedure (P = 0.93). There was a significant difference between two groups regarding reaching the optimal sedation grade (2 and 3) after 10, 20, and 45 minutes, respectively (P = 0.005, P < 0.001, and P < 0.001). Thus, the number of children in group 2, who reached the ideal or desired sedation was greater than group 1 (Tables 1 and 2). Repeated measurements test of comparing the grades of sedation in children showed that there was a significant difference between two groups (P = 0.017) and also there was a significant statistical difference within the groups (P < 0.0001). A significant difference was statistically observed in the rate of pediatric movement between two groups during procedure (group 2 had fewer movements than group 1) (P = 0.005). Likewise, there was also a significant statistical difference between two studied groups (P = 0.009) with regard to the evaluation of pediatric overall behavior by means of above-mentioned criteria during treatment (group 2 was better than group 1). The patients were followed up two weeks after their discharge and mood changes in two groups were asked by telephone from their parents and showed that behavioral changes were less in group 2 than in group 1 (P = 0.04). The mean period of recovery was 34.37 ± 14.23 min in group 1 and 27.25 ± 5.14 min in group 2. There was a distinct difference among two groups in this regard (P = 0.003). 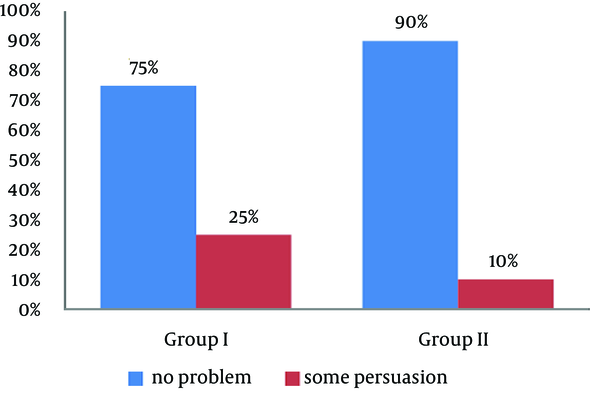 No considerable side-effect was seen in the studied groups (Table 3). Based on the results of this study, it was found that in comparison to diphenhydramine, oral administration of midazolam, atropine, and ketamine cocktail is more effective in painful procedures in terms of sedation and it has fewer psychological side-effects during two-week follow-up in these patients. For many patients, especially children, the experienced fear and anxiety before a medical or diagnostic procedure, anesthesia or surgery may act more hazardous than the disease per se, and for this reason prior to any effort, sedation of child in the emergency department will remarkably decreases unwilling side-effects (12). Several studies indicated that approximately all sedative drugs could be effective as tranquilizers. But, the suitable sedative should be selected by considering the rate of sedation, its side-effects and contraindications. Most of the studies have been carried out by taking a single drug or combination of several drugs, including ketamine, midazolam, diphenhydramine, glycopyrrolate, meperidine, and fentanyl (13). There are few studies in which the sedative effects of midazolam, atropine, and ketamine cocktail have been examined. In a study on 19 children under medical care for burning wound, Humphries et al. examined the sedative effect of oral ketamine compared with acetaminophen codeine and diphenhydramine cocktail. Compared to another group, the patients in group of oral ketamine experienced higher level of sedation (14). In a recent study that was done by Golzari et al. on 100 referent children to emergency department who needed to undergo painful procedures, the cocktail, including diphenhydramine and midazolam was followed by better significant quality of sedation compared with diphenhydramine alone (15). In the present study, treatment by midazolam, atropine, and ketamine cocktail has revealed a better sedative effect compared with single drug treatment with diphenhydramine along with fewer side-effects. Most of the studies showed the more efficiency of drug cocktails compared with single drug in pediatric sedation (10, 12). Meanwhile, our study have shown that cocktail of midazolam with another sedative might play a noticeable role in pediatric sedation. Eskandarian et al. compared the clinical effects of midazolam/ketamine cocktail with midazolam/hydroxyzine cocktail before starting dental procedures. In their study, pediatric behavior was assessed with regard to four states i.e. somnolence (drowsiness), crying, movement, and general behavior. 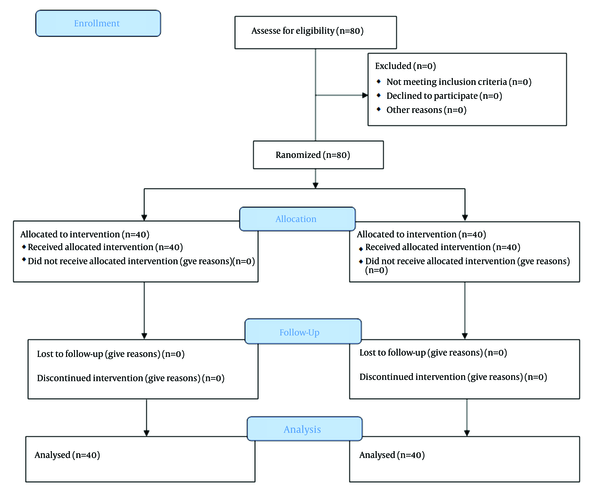 In their survey, midazolam/ketamine cocktail acted significantly more effective compared with midazolam/hydroxyzine cocktail during injection and procedure with respect to rate of drowsiness, crying, and body movement and more successful with respect to evaluation of general behavior status (2). Similarly, Golpayegani et al. investigated that midazolam/ketamine cocktail had deeper sedative effects than midazolam/promethazine during the treatment (16). Pruitt et al. observed that intramuscular injection of midazolam, ketamine, and glycopyrrolate cocktail has been accompanied with the suitable sedation level in medical diagnostic measures (17). Also Bocskai et al. evaluated the sedative effect of muscular administration of midazolam, atropine, and ketamine cocktail in 276 children to assess the auditory response. Their findings suggest the favorable effect of this cocktail in diagnostic procedures (18). Wang et al. studied the sedative effects of midazolam, atropine, and ketamine cocktail with two different doses before surgical operation. One group of patients, who received higher dose of drugs with rectal atropine, was apparently subjected to drowsiness when they were separated from the parents, and they cried less during peripheral intravenous cannulation (19). In another research, Bhatnagar et al. observed that oral ketamine, midazolam, and atropine muscular cocktail had similar anesthetic and sedative effects but oral route is more acceptable for children since its painlessness (20). Our study had some limitations, including a small sample size and inclusion of just children who were older than 2 years old. However, the rapid onset of sedation and short duration to peak sedation of ketamine, midazolam, and atropine cocktail as a sedative drug can be considered as an advantageous result obtained from our study, which can be used in most outpatient settings. With respect to above-mentioned findings, and results of the current research, it can be stated that oral administration of midazolam, atropine, and ketamine cocktail has noticeable sedation effects in children and it is followed by a little temperament change compared with diphenhydramine (more behavioral side effects of diphenhydramine than our cocktail is due to its antihistamine and anticholinergic effects). For this reason, oral administration of midazolam, atropine, and ketamine cocktail can be used in the emergency department safely. It has been shown in this trial that midazolam, atropine, and ketamine cocktail reached significantly higher-quality sedative effect compared to diphenhydramine as a single drug and no unwilling side-effect was observed. Furthermore, our cocktail had fewer behavioral adverse effects than diphenhydramine. Hence, it can be adequately used for pediatric sedation in the emergency departments. The authors are grateful to all medical personnel and patients who participated in the study, as well as data collectors, supervisors and administrative staff of the Emergency Department of Imam Reza Hospital. Special thanks to Anesthesiology Research Team, Department of Anesthesiology, Tabriz University of Medical Sciences, Tabriz, Iran. This article was written based on the dataset of Farid Eftekhari Milani’s specialty thesis entitled “Effectiveness of oral ketamine-midazolam-atropine cocktail versus oral diphenhydramine for pediatric sedation in the emergency department,” registered in Tabriz University of Medical Sciences (No: 9154) and was presented in, June, 2014. Authors' Contributions: All authors have read and approved the manuscript. Hassan Soleimanpour, Ata Mahmoodpoor, and Farid Eftekhari Milani collected the data, reviewed literature, and drafted the manuscript. Kavous Shahsavari Nia, Robab Mehdizadeh Esfanjani and Saeid Safari designed the major parts of the study and performed the statistical analysis. Funding/Support: This article was not supported by any funding organization. There was no sponsor for this work.